First opening as the Fortune Thriller Theatre in 1924, the building was one of the first to be built after the First World War. Undergoing several refurbishments, the building retains its original concrete façade and is believed to be the smallest venue in the West End. Since 1989, the Fortune Theatre has hosted thriller The Woman in Black, which regularly attracts sold-out performances. With a very small seating capacity of 432, the Fortune Theatre is split across three intimate sections, including the Stalls, Dress Circle and Upper Circle. A variety of views are on offer, with the best options being in the Stalls and Dress Circle, as The Woman in Black relies on building suspense and tension, and seats in the Upper Circle may feel too distant. Due to the intimacy of the theatre, you can see most detail, however there are restrictions to certain parts of the stage and it is worth double checking before booking. Check out our seating price chart below, which will help you find out the quality of the view for the ticket you purchase! Please note that prices differ depending on the day of the week and peak performances. £60.00 (Premium Seats) There are only a handful of premium seats, located in the centre of the Stalls, rows E-G, seats 12-15. These are the best seats in the theatre. They offer a central view with no restrictions, allowing you to see every detail. Not available. Not available. £47.50 The majority of the Stalls fall under this price, and it can be worth purchasing these seats over premiums, as the view on offer is very similar. It is best to sit as centrally as possible, although the theatre is small and narrow and has minimal restrictions. Almost the entirety of the Dress Circle is this price, as an amazing view of the stage is on offer with no restrictions. Sit as centrally as possible, although the intimacy of the theatre ensures seats at the ends of rows do not suffer. Not available. £37.50 Row L falls under this price bracket, due to being at the rear of the Stalls and suffering slightly from the Dress Circle overhang, which can obscure part of the stage. These can be good bargain seats, although you may miss some of the tension from here! 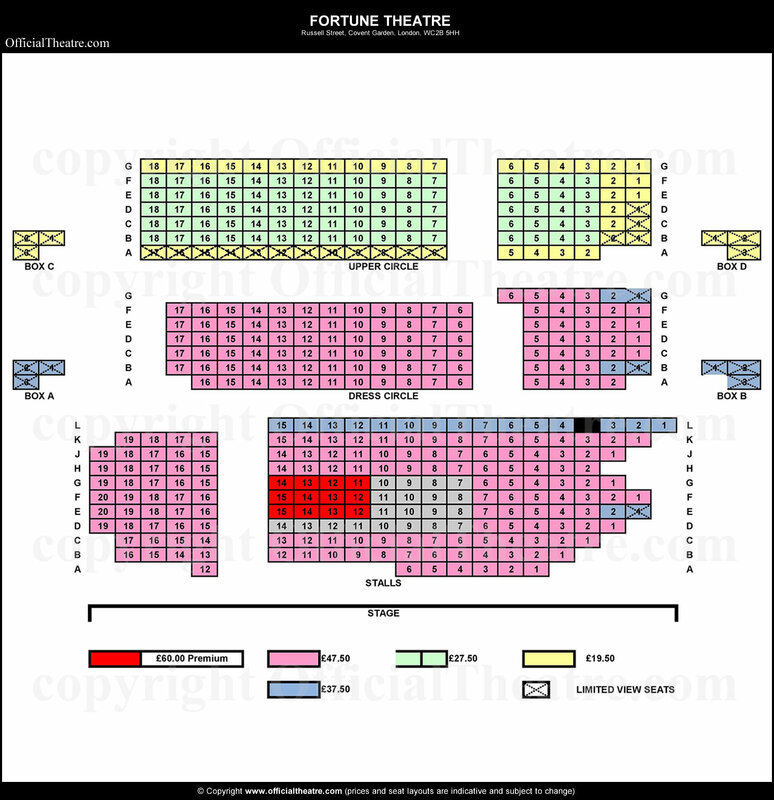 Seats 1-2 of Row E are this price, as they are limited view, with part of the stage cut off. Seats 1-2 of Row B and G are this price, as they are limited view. Part of the action that happens stage right can be missed from these seats, which may hinder the enjoyment of the show. Boxes A and B are this price as they are limited view and may require you to lean forward to see the stage. Not available. £27.50 Not available. Not available. Seats 3-18 of rows B-F fall under this price. Although there are not any restrictions from these seats, the stage may feel a little distant, which may ruin some tension of this particular production. It is best to choose these seats if you have already seen the production or are on a budget. £21.50-£19.50 Not available. Not available. Boxes and Row A are this price, as they are restricted by the Upper Circle safety rail and it may be necessary to lean forward in these seats. Seats 1-2 at the ends of each row are this price, as part of the action stage right is obstructed. Row G also falls under this price, as it is distant from the stage and can lose a lot of the tension in the show!